Part of Hawaii’s allure is that it’s a mix of exotic and foreign while still remaining somewhat familiar. The familiarity comes from the fact that it’s a U.S. state, which means there are modern conveniences you’d expect to find in a first-world country. However, the “foreignness” is felt in a couple ways. First, this Pacific Ocean archipelago feels like a part of Asia (or at least would to those who have been). The native Hawaiians have Polynesian features, preserved and still use their language, and continue to practice centuries-old traditions. Additionally, the islands are fighting to stay as undeveloped as possible to preserve the environment and the lifestyle the natives have been used to for centuries. These aspects of Hawaii reminded us of the Asian islands we visited in Malaysia, Thailand, Cambodia and Laos. 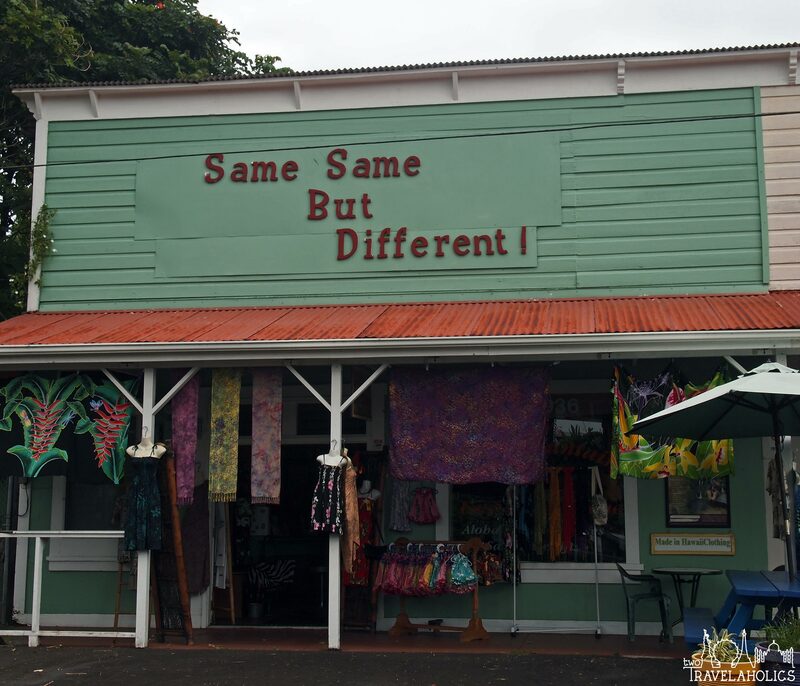 “Same same but different” is a phrase we heard all over SE Asia and, funny enough, we found this store in Hawaii. It made us realize that we weren’t crazy to compare Hawaii to islands in SE Asia. 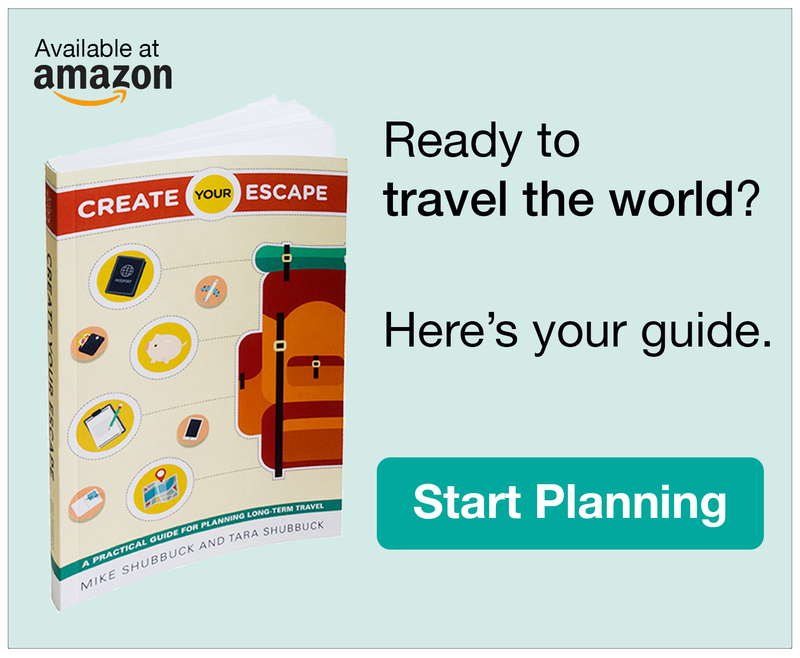 None of these features, however, make it an intimidating place to travel. It is easy to get around, though a bit on the pricey side. But one of the fun and interesting aspects of visiting Hawaii is to compare and contrast this state to others. 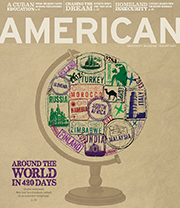 There are also numerous unique experiences to be had, some of which you literally cannot do anywhere else in the world. We visited O’ahu and the Big Island of Hawai’i for two weeks at the end of December and beginning of January. Here are a few of the most memorable* things we did that we highly recommend to other visitors. There is no excuse for passing up the opportunity to see the green sand beach. 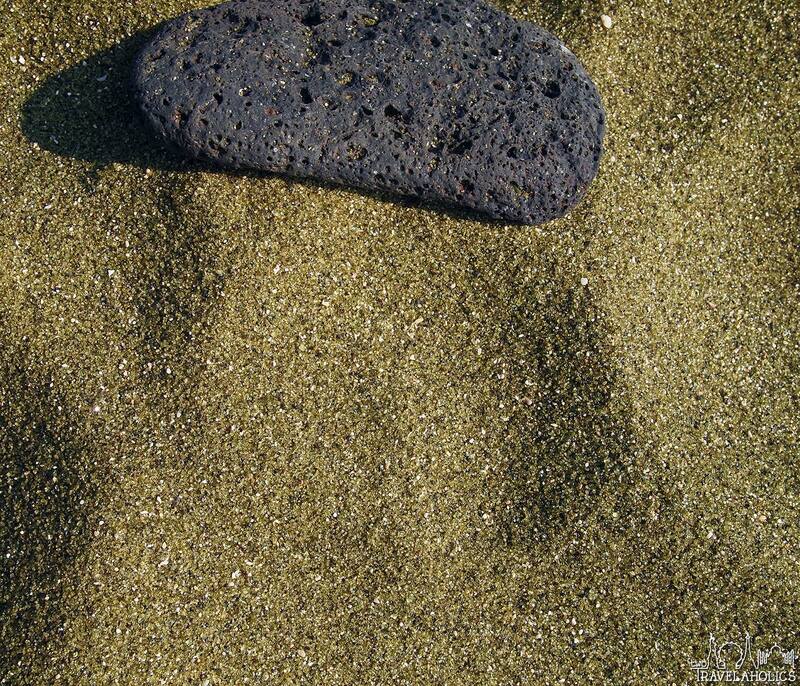 The number of green sand beaches in the world can only be counted on one hand – one hand, people! Sure, Hawaii offers beaches with white sand and black sand too, but green?! It is so neat you have to see it to believe it. With a little effort and a few hours to spare, you could be watching waves crash on a green shore while resting your feet on green sand. 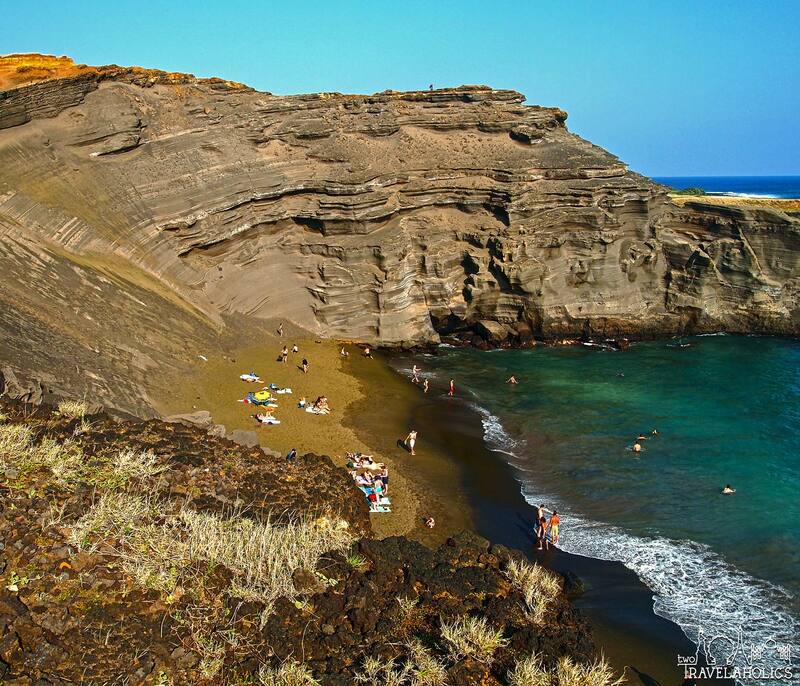 Papakolea Green Sand Beach is on the Big Island of Hawaii, and it requires driving near the southernmost point of the United States (known as Ka Lae, or South Point) followed by a two-mile one-way trek. View of the green sand beach from the top of the surrounding cliffs. This crescent-shaped beach is carved into a steep rock face, and the views from the surrounding cliffs are amazing. Due to the recessed nature of the beach, it is safe to swim there, making it a great cool-down opportunity. When we went, the amount of people peaked at 75 around mid-afternoon, but thinned to about half of that by the time we left a couple hours later. Even though we each only brought a 30-liter backpack with a day bag for this two-week Hawaii vacation, we brought our own snorkel gear. It is Hawaii – islands surrounded by water – so we wanted to ensure that we could jump in anywhere that was rumored to have good underwater sights. In most cases, this worked as planned, but there were two times when we opted to go through a tour company instead (swimming with sea turtles off the coast of O’ahu was the other experience). 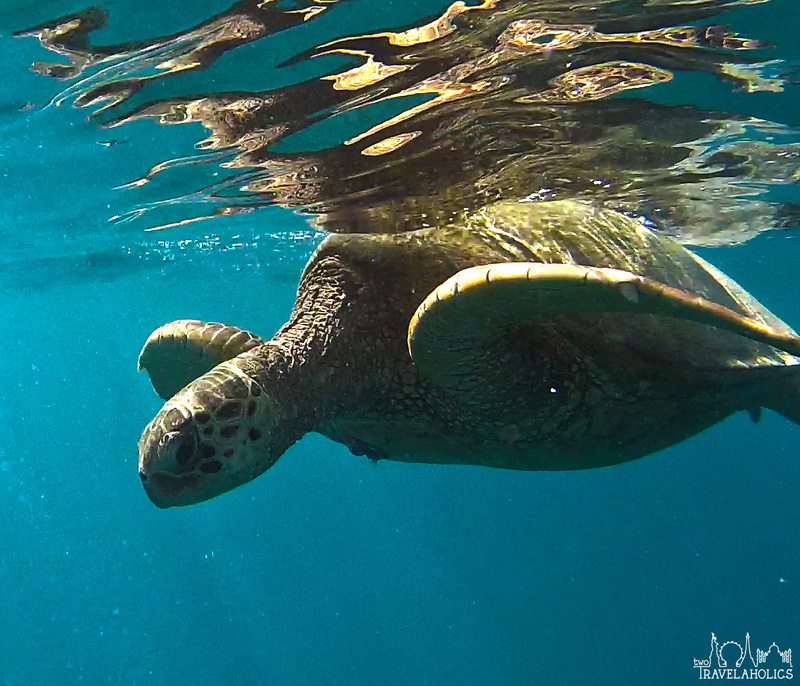 Swimming with sea turtles off the coast of O’ahu. On the Big Island, we heard there’s a bay that attracts manta rays at night. In a fortuitous twist of fate, the hotel we were staying at was situated right along that bay! One of the hotel’s restaurants is appropriately named Rays by the Bay, and at night you could watch manta rays while eating or enjoying a drink. Given the choice, we wanted to jump in and see them up close. Since we do not SCUBA, we opted to join a night snorkel tour, and the whole experience was incredible. We left the harbor just as the sun was setting and cruised toward the open water. It wasn’t long before we were lucky enough to spot humpback whales breaching nearby. When the sun was nearly set, we headed to Keauhou Bay (also called “Manta Village”) where we received our instructions (basically, no touching the rays) and our gear (the boat would drop anchor and set up an elongated buoy that would float off the stern of the boat). When we were ready, we jumped into the water and gripped this “buoy” (think of it like a floating ladder) with both hands while our legs were propped up with a floatation noodle. This ensured we could float above the manta rays without touching them. Attached to the buoy was a series of powerful lights that were aimed down to attract plankton. It didn’t take long before plankton – the food that attracts the manta rays – were circling the light like moths. 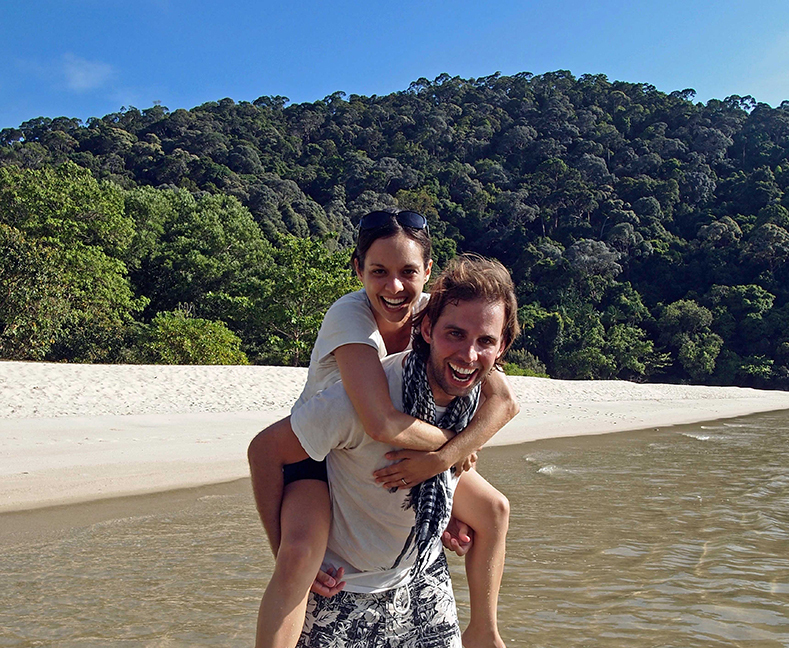 We barely stepped foot into the water before everyone was shouting that a manta ray was coming up. The rays we saw were a few hundred pounds, but somehow also incredibly graceful swimmers. For 45 minutes, we held onto the buoy while they did backflips inches below our faces while scooping up plankton. The way they effortlessly somersault backward to eat has been described as an underwater ballet, and that’s certainly the best description we can think of too. Watching manta rays swim around as they came within inches of us is one of the most memorable underwater experiences we have ever had. 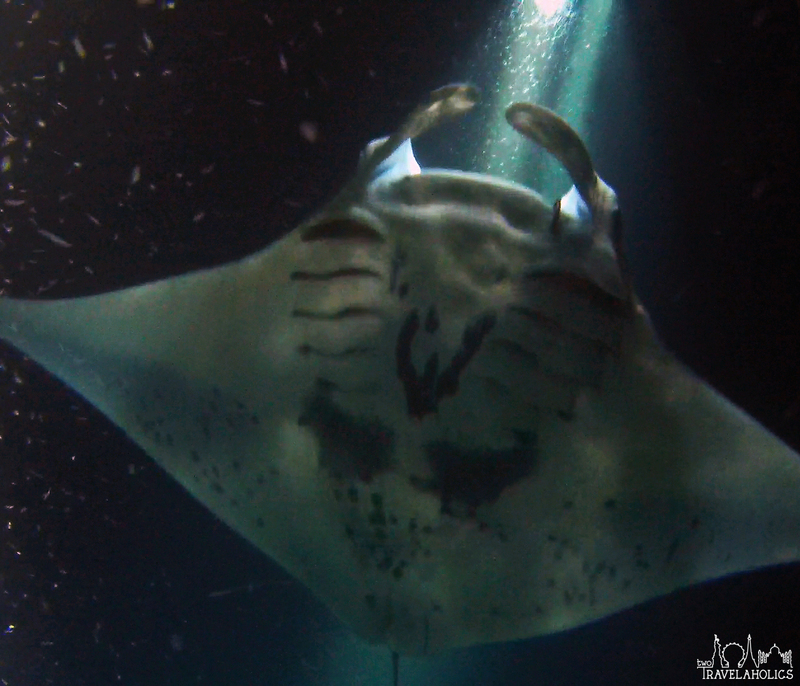 Snorkeling with manta rays at night in Hawai’i. 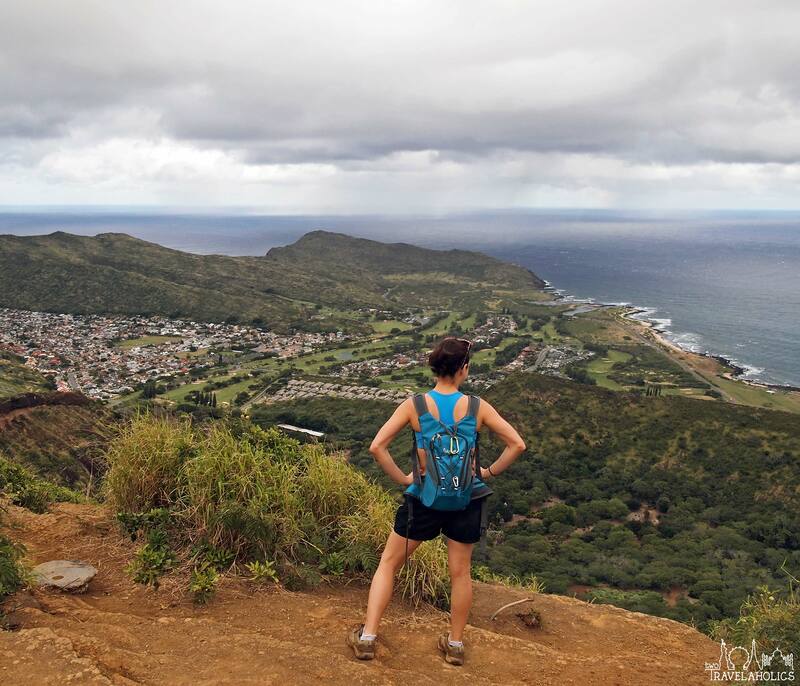 While tourists on O’ahu often flock to Diamondhead trail to hike to its peak and enjoy the view of Waikiki Beach, we recommend heading to the Koko Crater to climb 1,048 steps to a height of 1,208 feet at the top of the crater’s rim. 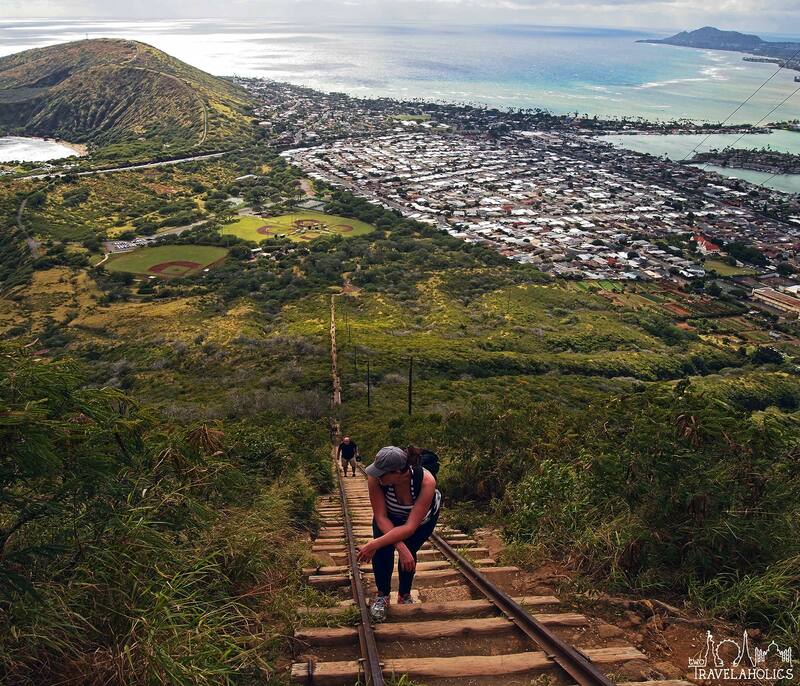 From the top, you can see Diamondhead and Waikiki, but you can also view the immense crater below and an unforgettable panoramic view of the southeastern corner of the island. While 1,048 steps may sound intimidating (not to mention the resident bees in one area of the hike), this trail does not have to be scaled quickly. The view during the whole climb is spectacular – and you should stop and enjoy it on the way up. View while hiking up the Koko Crater Trail. Before we began our ascent, we had to scratch our heads at the trail and wonder how we’d complete the hike. From the foot of the trailhead at Koko Head District Park, the view of the path to the top looks incredibly steep – like rock wall climber steep. Undeterred, we made the climb in the heat of the day, thankfully having the foresight to pack a couple water bottles. The trail follows a now defunct set of railroad tracks (which are a de facto set of stairs to climb), which range from gradual to severe in their incline. In addition to taking plenty of water, we recommend wearing sneakers and light, breathable clothing and taking frequent breaks. The trail can get crowded, but fellow hikers are respectful if you need to get to one side and take a breather. The ascent will likely take 45-60 minutes depending on the amount of breaks and pictures you take along the way. However, we ran into at least five people in workout mode who ran up and down (some with leg weights or weighted backpacks) who probably completed the ascent in 25 minutes. Remember the mention of resident bees? Well, there is a 40- to 50-foot section of the trail where the slats are suspended at least 15 feet above ground. There is a beehive in this area – or maybe more than one, but we didn’t stop to find that out). The bees likely won’t harm you, so you kind of have to zone them out and keep trucking, though it can be a harrowing experience. On the bright side, which we discovered after ascending through the bees, there is actually a short detour path that you can take around the trail that avoids this nightmare. Once you finish the hike up, this workout leaves you breathless, as does the 360° panorama from the top of the crater wall. Tara enjoying the viewing of Koko Crater from the top of the rim. Any time we travel, we always make it a point to try the local fare, whether that means seeking out a particular dish wherever we can find it or a well-known eatery that serves it. Besides just enjoying the flavors of a new dish, eating the local cuisine provides another way to experience the culture of your destination. It reveals information about the region, like which vegetables and spices are readily available, and even historically important occupations, like fishing or rice farming, that are part of the culture’s identity. Poke, which in the Hawaiian language means “to slice or cut,” has gone from being just a homemade staple to a widely available dish, now sold in restaurants, supermarkets and even drugstores (we spotted it in Longs Drugs). 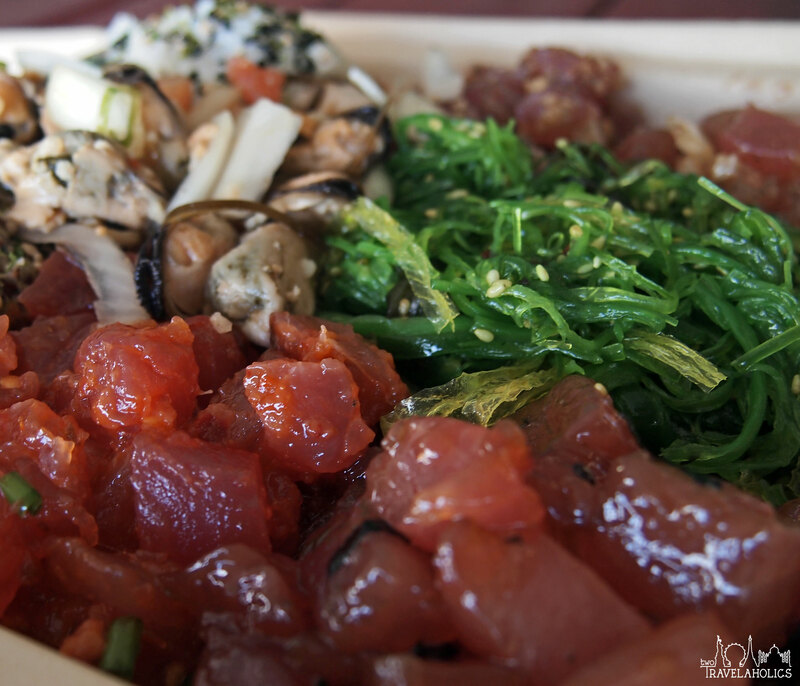 Throughout its history, poke has evolved to include different ingredients that were introduced to Hawaiians by other cultures – like soy sauce, for example, which is known in Hawaii as shoyu, also the Japanese word for soy sauce. Like any dish, there are as many varieties of poke as there are people who make it. Types range from wet (with liquid seasoning) to dry, spicy to mild, sweet to salty, and sometimes the star of the show (usually tuna) will change to octopus or tofu. Even with all the variety, there is a typical combination of ingredients that is easy to find around the islands. This poke recipe usually includes cubed raw ahi (tuna), sesame oil, soy sauce, Hawaiian sea salt, seaweed, sliced raw white onions, chopped green onions, sesame seeds, and bits of roasted kukui nuts. Since tuna is abundant in the deep waters surrounding the Hawaiian Islands, the raw cubes add a sweet flavor that pairs nicely with the other ingredients. Ahi poke with seaweed salad and other accompaniments from Da Poke Shack. If you’re spending time on the Big Island of Hawaii, we highly recommend stopping by Da Poke Shack. They had about 10 varieties when we went, and we got to taste-test them before deciding what to order. Fresh fish is going to be sold at market price, so the cost will fluctuate daily. When we were there, poke was going for $16.95/pound. Eating at Da Poke Shack was a great opportunity to try a variety of poke, and the price is very reasonable compared with other local vendors. It’s no wonder that Yelp found it to be America’s best-rated restaurant on the site in 2014. We also highly recommend it! A couple-hour drive south of Kona is Volcanoes National Park, one of the “must-see” locations on the Big Island. For the low price of $10, we were given a ticket that allowed re-entry for our vehicle for seven consecutive days and the ability to drive inside the park (camping is allowed as well but requires registering with the Park Rangers). When we arrived, we made a beeline for the Visitor’s Center to score free maps and advice for where to go. Initially, we were prepared to spend the entire day hiking and exploring the park on our own, but then we stumbled upon a happy coincidence when we arrived. The Park Rangers were preparing to lead a free hike into Kilauea volcano’s caldera (throughout the day, rangers offer guided hikes through various parts of the park). 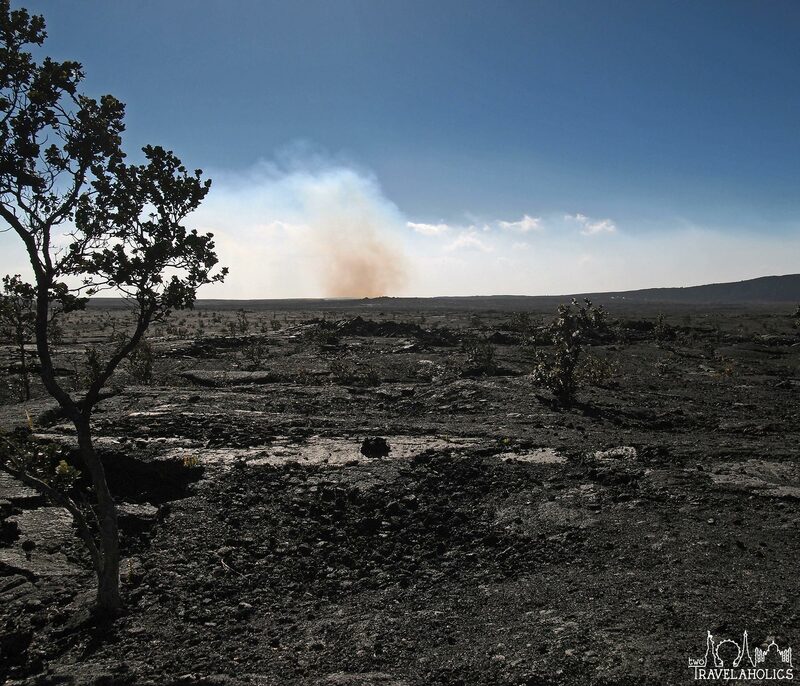 This particular hike, called Into the Volcano, is done quite infrequently (it is contingent on vog or volcanic gas emissions), so it was a special treat for the visitors and rangers alike. At the time (and most of the time based on what we were told), unguided hikers were prohibited from walking past a certain point onto the caldera, but the volcano’s and atmosphere’s conditions were just right that day to allow the rangers to lead visitors past the “no entry” sign and further onto the caldera. On the Kilauea caldera. A vapor plume is being emitted from the Halemaʻumaʻu Crater in the background. Our enjoyment of the park was significantly elevated because of our participation in this hike. We not only had trained guides who provided running commentary on the history and geology of the park, but who were also friendly and had a great sense of humor, making the three-hour hike a very enjoyable and memorable one. Once on the caldera, we were able to feel vents producing hot air, saw what appeared to be millions of silky spider webs (in reality, these were thin strands of glass, a byproduct of lava), and had a unique, up-close view of Halema’uma’u Crater (the currently active open lava vent). While we were only on the crater for 20 or so minutes (the ranger’s emission alarm went off warning us of heightened levels of vog in the air), it was enough time to admire our surroundings, inspect the ground below our feet and snap lots of pictures. The entire hike took nearly three hours, but was well worth the time. We would definitely recommend this and any other ranger-led hike in Volcanoes National Park instead of only exploring on your own. And make sure to end the night at the Jaggar Museum for an incredible view of the lava glowing from within the Halema’uma’u Crater. 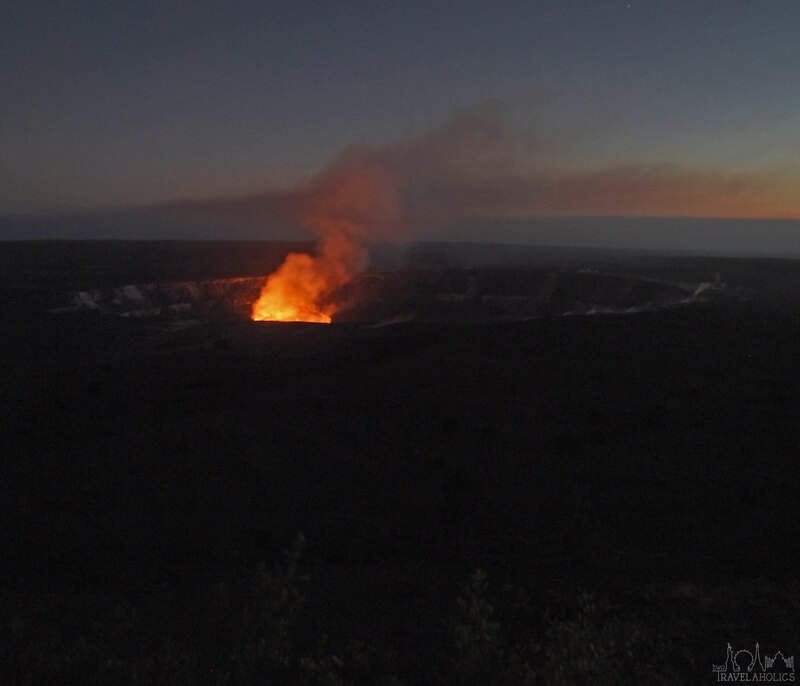 View from the Jaggar Museum of lava glowing from within the Halema’uma’u Crater at night. What a great post. You guys make me want to visit Hawaii! Destination weddings a re the best! Looks like a great relaxing vacation spot without having the air of all inclusive resort. We want to visit soon!